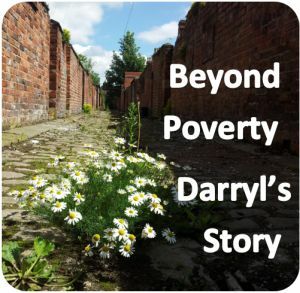 Darryl’s story shows us the links between childhood poverty and crime, and the importance of positive rehabilitation. Darryl grew up in Oldham. His mum left home when he was just 4 weeks old, “She just lost interest and stopped coming to see us not long after that. Grandma told me it was because Mum wanted a girl, and I was a boy”, he remembers. “I hardly ever saw her after that. Never at all in my teenage years”. His father had to bring up Darryl and his two older sisters on his own, and although there was always food on the table, it was a struggle to buy anything extra with his dad’s wages from packing in a warehouse. Darryl had a rough and hard youth. “I was excluded loads of times from school, getting into trouble for stuff like fighting and verbally abusing staff. I did it all to get attention. To prove I could do things”. Darryl was eventually expelled. “Behind all of this was money. “I always wanted money. To buy things I didn’t have. It started off petty, thieving a CD from the shop. Trespass and probably some criminal damage too”. But then he fell into company with people who just drank and did drugs all day. “We ended up doing a lot of drugs, drinking, and getting caught in drug dealing. It made me even more desperate for money. And the crimes started getting more serious.” Darryl got involved in a spat with other lads in town, and was sent to prison for three and a half years. Darryl was in prison for a year and a half, before being released. Everyone in hospital said to me ‘you’re never getting out’, meaning that I would never turn my life around. But I did and if I can do it, anyone can. Now I want to help others. Darryl has made a success of his life since leaving hospital. He moved from 24/7 supervision, to being supported from a distance, for just 6 hours a week. He spent a long time volunteering in the kitchen at Back on Track, a Manchester charity that enables disadvantaged adults to make lasting, positive changes in their lives. Darryl has a passion for cooking and performing arts, and has been singing with Streetwise Opera, a choir that works with individuals with experience of homelessness. He is now studying performing arts at college, and will soon start as a volunteer with Neshomo, befriending long term mentally ill people in the Greater Manchester Jewish community. Some studies find a strong and direct relationship between socioeconomic status and offending, particularly in respect of the impact of childhood poverty and the effects of growing up poor on persistent youth offending (Braithwaite, 1981; Jarjoura et al 2002; Hay and Forrest, 2009; Bjerk, 2007).